I've been away from this forum for a couple of weeks because I have had a really busy time at work, but I have managed to keep up with my routine so though I would check in as things have got calmer now!! I have been taking MSM and Spirulina daily. Co-washing once a week. Doing a moisture DC once a week with wheatgerm oil -> Boots ingredients coconut and almond hair mask -> safflower oil layered on my hair over night. I have been using the search and destroy method to trim any split ends and protective styling 100% of the time. I have also been using a Jamaican Black Castor oil mix on my scalp after I wash and co-wash in the hope of gaining a few extra millimeters!! I love henna n placenta it's the best thing I ever tried on my hair. I got tired of buying those packets every week so I purchased the bottle online. There was a lot of build-up on my scalp and hair from the beeswax, so I decided to wash. I think I'll limit my beeswax application to once a week instead of applying it daily. 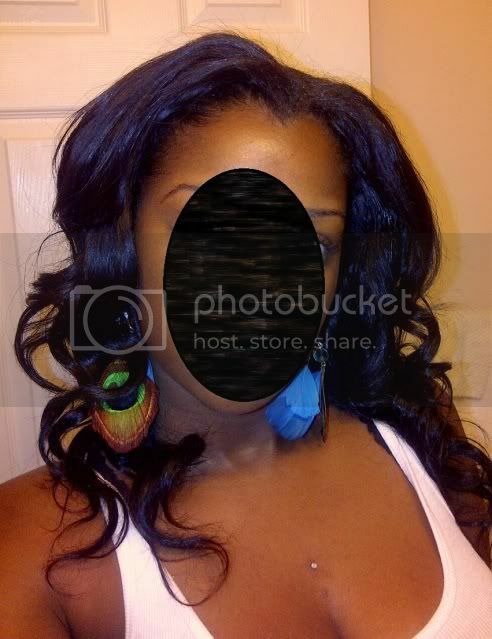 - Steamed w/Hooded Dryer, turbans, plastic caps, etc. Just wanted give a mini update. I cut off about a 1-1.5 inches of hair. I'm sad but it had to be done. I had so many splits uggh! Now I'm grazing BSL instead of grazing MBL. It'll grow back. I also just received a shipment of Wen yesterday. I kept hearing all these raves about it and decided to try. I'm going to use it today when I wash. I also am going to be reinstalling a curly u-part wig with hair I bought from Kevin later. Back to the weaves for me. I'm due for a protein treatment this week. I'm hitting that point again just like I did towards the end of last summer where the GHE is not working for me After I remove the shower cap, scarf, and anything else I have on my head my hair is still dry, no steam, no moisture at all. Any hoo I'll post another pic in two weeks when I'm done with my current bottle of hairfinity. When I start my next bottle I'll be adding extra msm, biotin, and folic acid. Hey ladies how is everyone doing? small update: I went back to the heat. Buns were getting boring and I couldn't deal with the hit or miss with twist outs, braid outs, bantu knot outs, etc. Yup last nite I had it and picked up my blow dryer and flat iron . I'm not going back to straightening weekly maybe once a month. For some odd reason I think my hair grows faster when I use heat idunno it's probably in my head. But I do take better care of my hair when it's straight, i.e. more moisturizing, scalp massages, etc. I also am dropping hairfinity. Idk what changed but it doesn't seem to be doing much for me anymore. Instead I'll just take a multi-vitamin, msm, biotin, and folic acid. I'm also finally gonna try that Hair Trigger I bought. Still hoping to be close to that 8 at the end of the year.